The Promised Messiah (on whom be peace) once remarked: Allah the Exalted is employing great emphasis on making the truth shine and in support of our mission but the eyes of these people do not open. He said once an opponent wrote to me saying that people have not been backward in opposing you yet we do not understand one thing, in spite of opposition you are successful in everything you do. This was of course by virtue of fulfilment of Divine promises. Our opponents continue to exert themselves to this day but with the grace of God the community continues to progress. Wherever Ahmadiyyat was suppressed or efforts were made to eliminate it, God enhanced the sense of sacrifice of Ahmadis of those countries and He opened up new avenues for the Jama’at in other countries. There is of course no doubt that the Jama’at was established by God’s own hands and it is going to continue to flourish in accordance with Divine promises. Below are some accounts of how hearts are inclined to the truth of the message of Jama’at. Our missionary in Niger writes that they once went on a Tabligh tour along a dirt road. Three days later they started their journey back on the same route when people of a village stopped them saying they had been waiting for their return. They took them to the local Imam who asked for Bai’at forms. Our missionary told them not to rush with Bai’at but the Imam said God had assured them and they were in no doubt of the truthfulness of Ahmadiyyat. When asked how that happened it was said that after Ahmadis had left a Wahhabi group came to the village and told the village people that Ahmadis were kafir (disbelievers) how could they have allowed them to preach! The Imam replied that therein was the difference; while the Ahmadis had only spoken of Qur’an and hadith the Wahhabis only mentioned others being kafir. The Wahhabi Maulawi returned unsuccessful while Bai’at took place in the village. Our missionary from Tanzania writes that a large jama’at was established outside Tabora through an Ahmadi called Sulaiman Jummah Sahib. He had distributed pamphlets in the area which was followed by Tabligh and this resulted in Bai’ats. With the grace of God the number of Ahmadis is increasing in the area. Although they are poor in worldly terms but they are filled with faith. They have even built a clay mosque. Ameer Sahib of Mali writes that an Imam of another sect took Bai’at and said that he had been listening to audio tapes of the Jama’at and the Jama’at radio station for a long time. He said his father was also an Imam who had converted many villages of idolaters to Muslims. His father had told him in a dream that Ahmadiyyat was the true way. Through the Imam thousands more took Bai’at. They went to another village for Tabligh. People gathered and some of them went home and returned with photographs of the Promised Messiah (on whom be peace) and Huzoor and some pamphlets. They said they had realised that it was the same community their deceased brother had told them about. They said their brother had worked in Ghana but fell ill in when visiting and died in the area. One thousand Bai’ats took place. Our mu’alim (teacher) from Mali writes that an Ahmadi went to a nearby village where people told him that it had not rained for a long time. They said if the Jama’at was truthful he should pray for rain and then they would appreciate its truthfulness. The Ahmadi mu’alim offer nawafil and prayed most heartrendingly for signs of truthfulness of the Jama’at to manifest. Huge rainfall followed and people of the village said they acknowledged the Jama’at was on the truth and all of them came in the fold of Ahmadiyyat. A missionary from Ghana who has passed away wrote that once an Ahmadi doing Tabligh was asked to pray for rain. He said since he was preaching to propagate the message of Imam Mahdi (on whom be peace) it would certainly rain. With the grace of God rain came and a large number of people accepted Ahmadiyyat. A new Ahmadi lady called Fatima from Ivory Coast said that she realised what true Islam was after taking Bai’at. She has left practising all the harmful innovations that other Muslims follow. Another new Ahmadi from Ivory Coast says that he has developed in spirituality after taking Bai’at. Offering Salat is an exhilarating experience now and he has vastly improved in his practical life. By virtue of becoming an Ahmadi it is now easy for him to practice real Islam and he has also developed in knowledge and insight. Missionary-in-charge of Guinea Conakry writes that a person came to our mission house wishing to seek Jama’at’s help to build a mosque in his village. An introduction of the Jama’at was given to him and he was told about the advent of the Promised Messiah (on whom be peace). He was very pleased after a long session where everything was explained to him and said his eyes had been opened. He suggested the Jama’at to visit to his village so that the message reached everyone. He says ever since he has taken Bai’at he feels a spiritual change in himself which he had never felt before. Missionary of Benin writes that a long time ago when our mosque was being built a Christian priest passed by and praised the beautiful building and asked whose mosque was it. When explained that it was an Ahmadi mosque he said he was familiar with the message of Ahmadi Muslims and felt they were truthful people. He was asked if he believed them to be truthful why did not accept Ahmadiyyat. The priest replied certainly Ahmadiyya Islam was truthful and he was where he was because of reasons out of his control. A Christian priest in The Congo became Ahmadi and said that although he had been a priest for years on end he did not feel the inner contentment and nearness to God that he felt after accepting Ahmadiyyat. A friend from Algeria writes that his mother had a dream that a sheikh comes to their home and gives the children Islamic teaching which has a very positive effect. Her daughter caught MTA while channel hopping and when she saw Huzoor’s photograph she was delighted and said it was the same person she saw in her dream. MTA informed them about the advent of Imam Mahdi (on whom be peace). She writes that after taking Bai’at all her anguish had changed into happiness (by practising true teachings of Islam). Missionary of Congo writes a local Ahmadi had a dream where he found himself facing a different direction during Salat. He did not understand the significance of this. Later, some pamphlets of the Jama’at were received in the area and a man travelled 260 kilometres to find out more. An Ahmadi mu’alim was called in to give the message. When the person was given the message by the mu’alim he accepted Ahmadiyyat. It was then realised that the dream was an indication of accepting Ahmadiyyat Islam. Many others also took Bai’at. A medical student donated a plot for building mosque. The direction faced during Salat (Qibla) is the same for all Muslims, so the significance of changing direction in the dream is that outward/apparent direction is not everything, one must change the inner direction of one’s heart and mind. Our missionary of Guinea Conakry writes that with the grace of God a large village situated 200 km away and some adjoining villages accepted Ahmadiyyat. When the Jama’at thought to properly establish itself in the area the chief of the village said all their resources were at the disposal of the Jama’at. 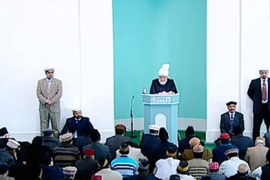 He said they were delighted to have joined Ahmadiyyat, true Islam which had opened their eyes. Ameer Sahib of Congo writes that message of Ahmadiyyat reached far flung areas through pamphlets spurring people to get in touch with the Jama’at via email. A mu’alim was sent to the area who stayed there for three months and gave the message. Many gatherings took place and with the grace of God more than sixty people accepted Ahmadiyyat. They have so excelled in sincerity and devotion that one of them travelled 600 km to attend Jalsa in 2013. 300 km were travelled by boat and the rest on a rickety old bicycle which he had borrowed from a friend. When our missionary saw the state of the bicycle the person had travelled 300 km to get to Jalsa he simply could not believe it. Our missionary from Lungi (Sierra Leone) writes that Tabligh was done to some people and they wished to accept Ahmadiyyat. However, a non-Ahmadi Imam who had trained in Saudi Arabia started speaking to them against the Jama’at which pushed them away. They and the Imam were invited to Jalsa. On second day of Jalsa the Imam came to our missionary and said, by God Ahmadiyya Jama’at is on the truth, I will not oppose it and if anyone wishes to join it I will tell them to go ahead and do it. An Ahmadi from Italy writes that Live MTA programmes broadcast from Kababir impressed him a lot and for about six months he did Bai’at in his hearts of hearts though he did not sign the form. He says he lives on his own and his delight in finding the truth of Ahmadiyyat Islam was boundless. He considers himself to be a sign of its truthfulness. He says he first saw MTA in 2008 when he had no knowledge of the Jama’at He continued to watch MTA programmes as he liked them very much and gradually he accepted the truth of Ahmadiyyat. He took Bai’at in 2013. An Ahmadi writes from Algeria that in 1990s he joined Civil Defence Squad because extremist Muslim groups were carrying terrorist atrocities in the name of Islam and the Squad protected people against them. He says he was distant from Islam at the time and was astonished to see Muslims killing Muslims in the name of Jihad and Islam. He wondered when the Imam Mahdi came would he also command such killing. An Ahmadi friend of his spoke to him and explained matters and told him about commentary of the Holy Qur’an which satisfied him. He was told that God had sent Imam Mahdi a century ago in India and he had an established community. Hearing this he felt as if God had listened to his prayers and he filled his Bai’at form! Shortly afterwards he had a dream. A holy person takes him by the hand in a dark field and walks to a sea bank where a boat awaits. Another person is also present there and all three board the boat. The holy person tells him that he is the Holy Prophet (peace and blessings of Allah be on him) and the other person is the Imam Mahdi and Promised Messiah (on whom be peace). The boat reaches a large ship and both the holy persons tell him to embark the ship and join the people on board. A new Ahmadi writes from Morocco that he is a teacher of history and geography and in spite of being blessed in worldly terms he was embroiled in self-centred, wicked ways. He was enabled to take Bai’at which led him to read books of the Promised Messiah (on whom be peace) which purified his inner self. President of our Jama’at in Japan writes that a Japanese person with whom he had been in touch for six months called after Huzoor mentioned a martyrdom that took place in Shiekupura, Pakistan in his Friday sermon. The Japanese person expressed the wish to accept Ahmadiyyat after hearing the news of the martyrdom. Ameer Sahib of Yadgir, India writes that a Hindu student saw the motto of Love for all hatred for none on the notebook of his Ahmadi fellow student. This motto had a deep impact on him and he asked for further information. He was given books and literature to read. After in-depth study and having watched the Jama’at’s service to humanity he was satisfied and took Bai’at in March 2014. A friend from Egypt writes that by God the Jama’at is truthful and remarks if only the rest of the world followed its teaching. He is most grateful that his father and then gradually his entire family took Bai’at. Our missionary from Bosnia writes that following Huzoor’s series of Friday sermons on reformation of practices there has been an increase in numbers at Fajr congregational Salat. In spite of severe cold weather, snow fall etc. new Ahmadis travel up to 10 km to offer Salat in congregation. An Ahmadi writes from Macedonia that his wife did not observe purdah. He expresses his gratefulness that after listening to Huzoor’s address to ladies at Jalsa Germany she has adopted purdah and is developing in faith. These are just a few glimpses from among countless accounts received in Huzoor’s reports of how God is guiding people to the truth of Ahmadiyyat, true Islam. These are signs of the truth of the Promised Messiah (on whom be peace). These accounts prove, in accordance with the prophecy of the Holy Prophet (peace and blessings of Allah be on him) the truth and excellence of the faith brought by him. It is most regrettable that Muslims are drawn in by the so-called religious scholars and reject to accept the truth. Prayers should be made for the Muslim Ummah. The Muslim world is in a pitiable state. Muslim leaders are oppressing the public and owing to lack of leadership the public are fighting the leaders. Sectarian killings are taking place. In the past governments used to contain sectarian violence between Sunni and Shia. Now governments are themselves embroiled in the clashes. Situation in Iraq, Syria and Libya has been getting bad to worse for some years. Now situation between Saudi Arabia and Yemen has also escalated and there is great danger of the fighting to spread. Satanic forces are succeeding in weakening Muslims. Earlier on direct attacks were made but now they are using their power to fuel infighting and the Muslims do not stop and think why the adherents of the last Prophet (peace and blessings of Allah be on him) are in such chaotic disorder! There is one way for them to avoid deterioration and that is to accept the Messiah sent by God. May God enable them to do so and may God enable us to pray for them! Two funeral Prayers were announced. Present funeral was of Intisar Ahmad Ayaz Sahib who passed away on 28 March at the age of 50 in Boston, USA. He was a maternal grandson of Maulana Abul Ata Jalundhri. He was born in Tanzania. He was a pious person, regular in reciting the Holy Qur’an and offering Tahajjud. He was devoted to Nizam e Jama’at and Khilafat and had served the Jama’at in various capacities. He was very fervent about Tabligh and had facilitated Bai’ats. He was an exemplary son, brother, husband and father. He is survived by his parents, sisters, widow and a nine year old son. May God forgive him and elevate his station and grant steadfastness to the bereaved. Funeral Prayer in absentia was of Waseem Ahmad, student of Jamia Ahmadiyya Qadian. He was drowned in the Beas River, India. His body was found after four days search but it had no mark on it and it did not have the usual appearance of a drowned body. He was a clever and hardworking student who was always at the fore front as regards observing Tahajjud Salat. He is survived by his mother, two older brothers and two sisters. May God elevate his station!